HEWI has developed a product portfolio especially for hotels, accommodation providers and restaurants, which supplements the ranges available to date. The outstanding features of the products are their robust, easy-care materials and high degree of functionality. Thanks to their reduced design the useful utensils can be combined with all HEWI sanitary systems. 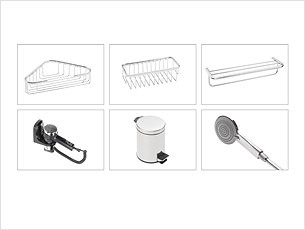 Shower baskets, waste bins, hand-held showers, a shower hose, towel shelf and hair dryer are available.